Apocalypse perhaps a little later? By stoat on March 28, 2013.
some scientists are arguing that man-made climate change is not quite so bad a threat as it appeared to be a few years ago... “climate sensitivity”... may not be as high as was previously thought. The most obvious reason is that, despite a marked warming over the course of the 20th century, temperatures have not really risen over the past ten years. It is not clear why climate change has “plateaued” (see article). It could be because of greater natural variability in the climate, because clouds dampen warming or because of some other little-understood mechanism in the almost infinitely complex climate system. But whatever the reason, some of the really ghastly scenarios—where the planet heated up by 4°C or more this century—are coming to look mercifully unlikely. Does that mean the world no longer has to worry? No, for two reasons. The first is uncertainty. The science that points towards a sensitivity lower than models have previously predicted is still tentative... 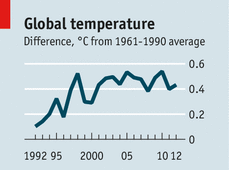 The risk of severe warming—an increase of 3°C, say—though diminished, remains real. There is also uncertainty over what that warming will actually do to the planet. The sharp reduction in Arctic ice is not something scientists expected would happen at today’s temperatures. What other effects of even modest temperature rise remain unknown? So, that's all pretty good, even if you don't like "plateau". So what does all this amount to? ... a small reduction in estimates of climate sensitivity would seem to be justified: a downwards nudge on various best estimates from 3°C to 2.5°C, perhaps; a lower ceiling (around 4.5°C), certainly... global temperatures rise by about 1.5°C for each trillion tonnes of carbon put into the atmosphere... At current rates, the next half-trillion tonnes will be emitted by 2045; the one after that before 2080... this could increase temperatures compared with pre-industrial levels by around 2°C even with a lower sensitivity and perhaps nearer to 4°C at the top end of the estimates. Despite all the work on sensitivity, no one really knows how the climate would react if temperatures rose by as much as 4°C. Hardly reassuring. Observed Arctic sea-ice loss directly follows anthropogenic CO2 emission? The Economist deserves a price for its most creative x-axis. And Lewis a "climate scientist" to boot. Incidentally, you sound like the sort of person who reads the Times - if so, any chance you (or one of your readers) could send me the text of this Ridley article? I heard it cited me, but I don't know if it was reasonable, dubious, or Rose-esque. Is a lower bound of .5C believable? Interesting use 'confirm' in that Telegraph quote. Perhaps 'suggest' might have been a little less... loaded. That sounds reassuring: the TCR is below estimates for equilibrium climate sensitivity. I'm not surprised your eyes glazed over. Nic Lewis, an independent climate scientist, got an even lower range in a study accepted for publication: 1.0-3.0°C, with a mean of 1.6°C. I thought NL was a 'semi-retired financier' or something similar. Nor did I know that his blog post at Bishop Hill had been accepted for publication. If this is correct, it will be interesting to see what the reviewers make of NL's submission. Economist "... it could be because of greater natural variability in the climate, because clouds dampen warming or because of some other little-understood mechanism in the almost infinitely complex climate system ..."
This is by far the most lucid analysis from main stream press since quite some time. Negative cloud feedback, little-understood mechanisms, almost infinitely complex climate system, natural climate variability: it may well be that anthropogenic CO2 has NO measurable effects in air temperatures in the next decades. Are you, or James Annan since he's here, concerned by the only very brief mention and perhaps dismissal of the deep ocean temperature data, as Dana picked out at SkepticalScience? But their argument does seem to include other new studies, and indeed some that aren't even published yet. Ridley's article is on his blog. This is unadulterated Pielkeism. One claim caught my eye. "Translated: the weather is just as likely to become less extreme as more extreme. So why is everybody convinced otherwise? Partly because they have been listening too much to the big insurance companies, which have a vested interest in bidding up our anxiety, as Dr Pielke’s remark reminds us." Ridley should take his own advice - "Forget the anecdotes and face the facts" - he is already the "pub bore". "In 2010 Brisbane disastrously overfilled a dam because it expected drought to return; the dam could not absorb a flood when it came." This is total crap sourced I suspect from reading Australian climate conspiracy cranks. Nicol is the chairman of the Australian Climate Science Coalition, a group of climate science deniers that includes Carter, Plimer etc. Would Ridley accept that as a rebuttal? Thanks for the Ridley link (and also the text from wmc). It doesn't look too horrible to me, at least the cite is reasonable. Yes, I'm afraid I'm not going to get too worked up (at least, not this time) if someone pushes back against all the hype that comes out whenever it is hot/cold/wet/dry/whatever. Of course AGW will change some of the weather, and lead to some different/bigger extremes in some sense. But there's a lot of weather irrespective of any trend. Setting it up as a question of trend versus variability is a bit dodgy, because the reality is not one or the other, but both together, in uncertain proportions. Eta Carinae's 21-Year Outburst: A Cosmic Instant Replay! Want to boycott stuff? There's an app for that. Did Ancient Aliens visit the earth and guide human evolution?